Mercury, the solar system’s innermost planet, reaches its greatest morning elongation from the sun tomorrow (Wednesday, May 26). The term greatest elongation specifically applies to inferior planets – the planets that orbit the sun inside of Earth’s orbit: Mercury and Venus. As seen from Earth, Mercury – like a dog on a leash – never strays far from the sun. 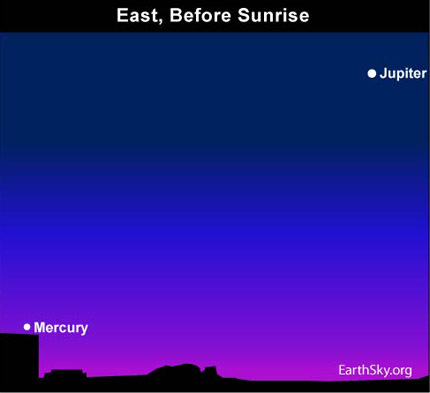 Mercury only becomes visible in the morning sky when it is far enough west of the sun to rise before the sun in the dawn or predawn sky. Because Mercury is now swinging to its greatest westward elongation, you will possibly catch this world above the eastern horizon some 45 minutes before sunrise – though you may need binoculars to see it. Mercury has three greatest morning elongations in 2010: January 27, May 26 and September 19. Although the May 26 morning elongation (25 degrees west) ranks as the largest of them all, this is a poor morning apparition of Mercury for the northern hemisphere. The September showing will be more favorable, despite Mercury swinging only 18 degrees west of the sun on September 19. In either the northern or the southern hemisphere, an inferior planet appears highest up in the morning sky when its greatest western elongation happens at or near the time of the autumnal equinox. In the northern hemisphere, this year’s autumnal equinox falls on September 23. Site contents copyright © 2019 Recorder Online	except as noted. All rights reserved. | 88 queries in 2.387 seconds.